Watchlopnik, with bonus toolopnik content. I wore a watch from 6th grade up through my early twenties, and it was usually something digital, black and with a rubber band. A Casio G-shock of some variety was usually on my wrist. Early in my time with the boy scouts Marine Corps, I stopped wearing a watch with the exception of a police academy where one was required. As a radio operator it turned out that I always had devices that would link up with the time one way or another and not wearing a watch always pissed off the chain the command, which meant I never again wore a watch after my first year or so. 10 years later as a para professional in academia, I began thinking that I could be watch person again. Because I’ve got something digital in my pocket to tell me all sorts of things including the time, I knew that analog was the only way to go. 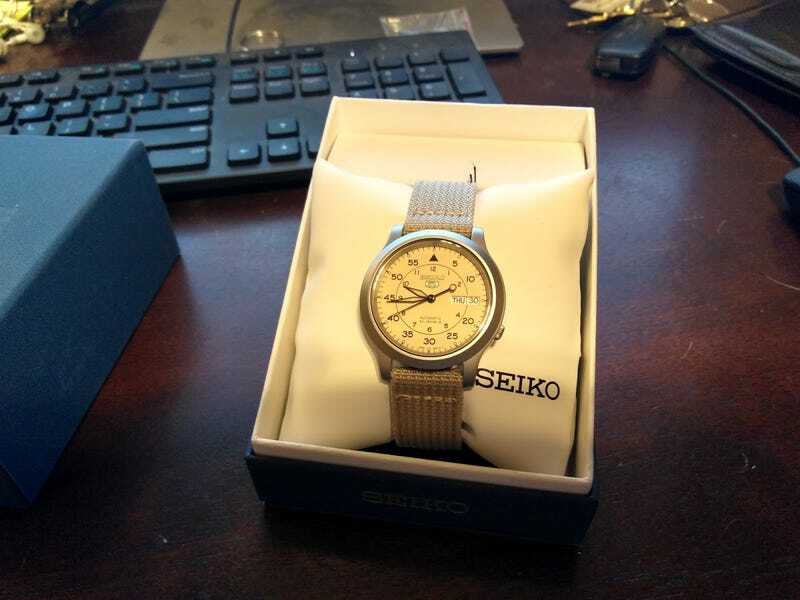 Mechanical things appeal to me, and all the reading pointed me towards a Seiko 5. In the snk803, I found what I was looking for. An automatic movement from a reputable maker, a small, light-colored face and matte silver bezel that doesn’t look like a piece of bling and a price that is reasonable to try being a watch person again. The clear back is neat, too. I knew not to buy a watch for the band, so I ignored the beige fabric strap that it comes with and ordered a brown leather strap and a spring bar tool at the same time. To my surprise, I actually didn’t hate the fabric strap it came with. Were it not for my suspicion that the beige strap would end up looking pretty dingy pretty quickly, I would’ve considered wearing it as it came out of the box for awhile. After a few minutes of fiddling around with the spring bar tool, I fitted the Hirsch camel skin strap I picked up with the watch. I’m a happy camper with the end result, and I think I’m a watch person again. At this price, I’ve already got ideas for a second Sieko 5 with a nato strap as a weekend/boating/golfing watch. Our Amazon overlord also brought me a new torque wrench. After thousands upon thousands of clicks (and so many of those re-torquing lug nuts between sessions at racetracks), ye olde craftsman torque wrench finally clicked chunked its way into the torque wrench afterlife. It was one of the first tools I ever bought. It’s no Snap-On or Matco, but it should do nicely.